Turner, K.L. and Sontheimer, H. (2014) Cereb. Cortex 24, 2388. KCa3.1 channel modulates migration of neuroblasts, an important event during development. Blocking the channel increased the stationary phase of neuroblasts. TRPC1 seems to provide the source of Ca2+ for the activation of KCa3.1 in neuroblast migration. Immunohistochemical staining of mouse brain sections using Mouse Anti-KCNN4 (KCa3.1, SK4) (extracellular) Antibody (#ALM-051) and Anti-TRPC1 Antibody (#ACC-010) shows that the two channels immuno-colocalize to neuroblasts (Figure 1). Figure 1. Immuno-colocalization of KCa3.1 and TRPC1 in mouse brain.Immunohistochemical staining of mouse brain sections using Mouse Anti-KCNN4 (KCa3.1, SK4) (extracellular) Antibody (#ALM-051) and Anti-TRPC1 Antibody (#ACC-010). YFP denotes neuroblasts. TRPC1 staining (blue) is detected in neuroblasts and outside neuroblasts as well (in astrocytes). KCa3.1 (red) is detected in neuroblasts. Merged image of all three staining (lower right panel) demonstrates the partial co-localization between the three.Adapted from Turner, K.L. and Sontheimer, H. (2014) with permission of Oxford University Press. ___ Cells + Mouse IgM isotype control + Goat-anti-mouse-Cy5. Antonioli, L. et al. (2014) PLoS ONE 9, e116253. There is increasing evidence showing P2X7 receptor’s involvement in inflammatory bowel diseases. P2X7 was detected in myenteric neurons of rat distal colon in immunohistochemical staining using Anti-P2X7 Receptor (extracellular)-ATTO-488 Antibody (#APR-008-AG), (Figure 1A). In the presence of colitis, its expression significantly increased in the neuromuscular layer (Figure 1B). P2X7 involvement was also reinforced using appropriate agonists/antagonists. Under both conditions, P2X7 immunocolocalizes with HuC/D, a neuronal marker. Overall, P2X7 receptor contributes to changes associated with bowel inflammation. Figure 1. Expression of P2X7R in rat colon.Immunohistochemical staining of rat distal colon section using Anti-P2X7 Receptor (extracellular)-ATTO-488 Antibody (#APR-008-AG). A. P2X7 staining (green) in normal colon sections co-localizes with that of HuC/D (red). B. P2X7 staining in the presence of colitis is detected in the neuromuscular layer and expression of the receptor is increased in myenteric ganglia. TOTO-3 (blue) was used to stain nuclei.Adapted from Antonioli, L. et al. (2014) with kind permission of Dr. Colucci, R. Div. Pharmacology and Chemotherapy, Dept. of Clinical and Experimental Medicine, University of Pisa Pisa, Italy. Expression of P2X7 in HEK-293 transfected cellsImmunocytochemical staining of live intact P2X7-HEK-293 transfected cells. A. Extracellular staining of P2X7-HEK-293 transfected cells using Anti-P2X7 (extracellular)-ATTO-488 Antibody (#APR-008-AG), (green, 1:25). B. Non-transfected HEK-293 cells also labeled with the antibody. Nucleus was stained using DAPI as the counterstain (blue). Direct flow cytometry analysis of intact living Jurkat cells:___ Unstained cells.___ Cells + Anti-P2X7 Receptor (extracellular)-ATTO-488 Antibody (#APR-008-AG), (10 µg/1x106 cells). Devesa, I. et al. (2014) Proc. Natl. Acad. Sci. U.S.A. 111, 18345. 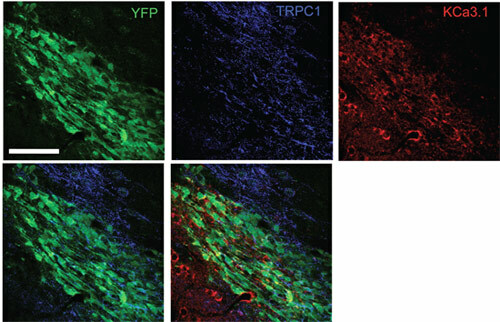 The upregulation of TRPV1 in sensory neurons is well documented in pain development. Proalgesics activate the channel by modifying its gating properties and/or increasing its expression at the cell membrane. Devesa, I. et al. show that these mechanisms are specific to TRPV1 and depend on calcitonin-gene-related peptide alpha (αCGRP). In part, immunocytochemical staining of mouse DRG neurons using Anti-TRPV1 (VR1) Antibody (#ACC-030) shows that TRPV1 co-localizes with CGRP in large dense core vesicles (LDCVs). Figure 1. TRPV1 co-localizes with CGRP in mouse DRG neurons.Immunocytochemical staining of mouse DRG neurons using Anti-TRPV1 (VR1) Antibody (#ACC-030). TRPV1 (green) co-localizes with CGRP (red) in large dense core vesicles (LDCVs).Adapted from Devesa, I. et al. (2014) with permission of the National Academy of Sciences, USA. Abdeen, A. et al. (2014) Am. J. Physiol. 307, F1227. Gentamicin is used to treat gram-negative bacterial infections. A side effect of gentamicin treatment includes nephrotoxicity. Aquaporin 2 water channel expression significantly decreases following gentamicin treatment in rats, an effect which is accompanied by a decrease in its urinary excretion. Immunohistochemical staining of rat kidney sections using Anti-Aquaporin 2 Antibody (#AQP-002) showed that AQP2 expression was not significantly changed in the cortex and outer medulla two days post gentamicin treatment. On day eight of gentamicin treatment, there was a significant decrease in AQP2 in both the medulla and inner medulla. 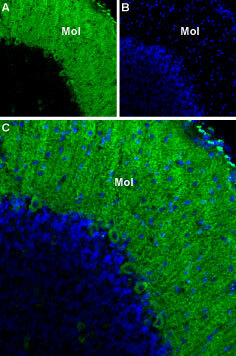 However, apical expression of AQP2 in the inner medulla increased (Figure 1). Overall, the data suggest that AQP2 could be a candidate for detecting kidney collecting duct dysfunction as a result of gentamicin treatment. Figure 1. Expression of AQP2 in rat kidney sections before and after gentamicin treatment.Immunohistochemical staining of rat kidney sections using Anti-Aquaporin 2 Antibody (#AQP-002) after GM treatment. Kidney sections from rats after 2 days of treatment with vehicle (control; A, D, and G) or GM (B, E, and H) or 8 days of treatment with GM (C, F, I, and J). Representative images of the cortex (A–C), outer medulla (D–F), and inner medulla (G–J) are shown. The box in I indicates the region of high magnification in J. Brown staining indicates the presence of AQP2.Adapted from Abdeen, A. et al. (2014) with permission of the American Physiological Society. Assentoft, M. et al. (2014) Am. J. Physiol. 307, C957. Aquaporin 4 (AQP4) undergoes in vivo phosphorylation at serine residues. Serine-to-alanine mutants were engineered and their plasma membrane localization was studied. 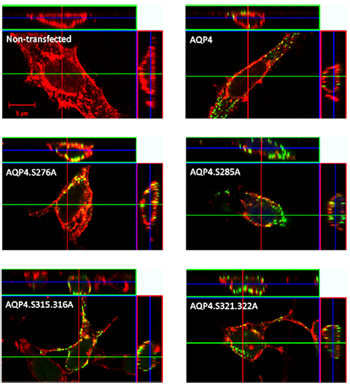 Immunocytochemical staining of transfected C6 rat glial cells using Anti-Aquaporin 4 (AQP4) (249-323) Antibody (#AQP-004) shows that none of the mutants affect AQP4 plasma membrane trafficking (Figure 1). Water permeability of AQP4 was also not changed in the different mutants. This study rules out serine phosphorylation as a means to regulate AQP4 trafficking and gating. Figure 1. AQP4 serine phosphorylation is not required for plasma membrane trafficking.Immunocytochemical staining of C6 rat glial cells transfected with wild type and AQP4 mutants. Cells were stained with Anti-Aquaporin 4 (AQP4) (249-323) Antibody (#AQP-004). Compared to wild type, none of the Serine-to-Alanine AQP4 mutants are affected by their ability to reach the plasma membrane.Adapted from Assentoft, M. et al. (2014) with permission of American Physiological Society. Diaz, P. et al. (2014) PLoS ONE 9, e90961. Syncytiotrophoblast is a highly specialized epithelia cell which plays an important role during pregnancy. This cell type has a very short life span and depends on proliferative mononucleate cytotrophoblasts to be renewed. IKCa1 (KCa3.1, KCNN4, SK4) channel is involved in the formation of syncytiotrophoblast and syncytiotrophoblast volume regulation. Immunocytochemical staining of isolated human cytotrophoblasts using mouse monoclonal Mouse Anti-KCNN4 (KCa3.1, SK4) (extracellular) Antibody (#ALM-051) showed that SK4 channel is indeed expressed in these cells (Figure 1.). Electrophysiological data show that the channel is also functional. Figure 1. Expression of KCa3.1 channel in human cytotrophoblasts.Immunocytochemical staining of human cytotrophoblast using Mouse Anti-KCNN4 (KCa3.1, SK4) (extracellular) Antibody (#ALM-051). A. Methanol fixed cells (15 hrs). B. Methanol fixed cells (66 hrs).Adapted from Diaz, P. et al. (2014) with kind permission of Dr. Diaz, P. and Dr. Greenwood, S.L. from Maternal and Fetal Health Research Centre, Institute of Human Development University of Manchester, Manchester, United Kingdom and St. Mary’s Hospital, Central Manchester University Hospitals National Health Service (NHS) Foundation Trust, Manchester Academic Health Science Centre, Manchester, United Kingdom. Lai, M.H. et al. (2014) Am. J. Physiol. 307, H1327. 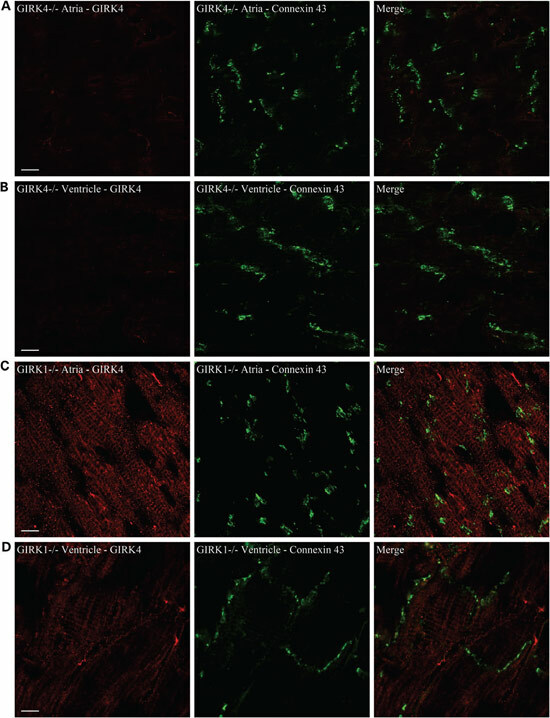 In addition to their role in shaping muscle and neuronal excitability, large conductance Ca2+-activated K+ (BK or KCa1.1) channels were shown to regulate sinoatrial node firing rat and cardiac pacing. Immunocytochemical staining of isolated mouse sinoatrial cells (SANCs) using Anti-KCNMA1 (KCa1.1) (1097-1196) Antibody (#APC-021) shows that the expression of BK channel overlaps with that of HCN4 (Figure 1). Electrophysiological data also shows that BK channels expressed in SAN cells are functional. Figure 1. Expression of KCNMA1 (BK) in mouse SAN cells.Immunocytochemical staining of mouse sinoatrial cells (SANCs) using Anti-KCNMA1 (KCa1.1) (1097-1196) Antibody (#APC-021). BK channel expression (red) overlaps with that of HCN4 (green). No detection of KCNMA1 was observed with the secondary antibody.Adapted from Lai, M.H. et al. (2014) with permission of the American Physiological Society. Subramaniam, M. et al. (2014) J. Neurosci. 34, 13586. The molecular mechanism by which the A53T mutation in the α-synuclein gene causes Parkinson disease (PD) was investigated. A mouse model overexpressing the mutant protein demonstrated: substantia-nigra specific increase of firing frequencies in dopaminergic (DA) midbrain neurons but not in DA neurons in the ventral tegmental area. The study showed that the frequency increase is caused by a redox-mediated impairment of KV4.3 K+ channels. However, immunohistochemical staining of mouse brain sections using Anti-KV4.3 Antibody (#APC-017) showed that KV4.3 channel levels increased in DA substantia-nigra neurons of α-synuclein mutant mice but not in DA neurons in the ventral tegmental area (Figure 1). Figure 1. Expression of KV4.3 increases in DA substantia-nigra neurons of α-synuclein mutant mice but not in DA neurons in the ventral tegmental area.Immunohistochemical staining of mouse brain sections using Anti-KV4.3 Antibody (#APC-017). A. Expression of KV4.3 increases in DA substantia-nigra neurons of α-synuclein mutant mice (lower right panel). B. Expression of KV4.3 does not increase in DA neurons of the ventral tegmental area in α-synuclein mutant mice (lower right panel).Adapted from Subramaniam, M. et al. (2014) with permission of the Society for Neuroscience. Miller, S. et al. (2014) PLoS ONE 9, e10751. TRPM8 channel is activated by cold stress and plays a key role in cold hypersensitivity. It is a therapeutic target in various pain disorders. Alomone Labs Anti-TRPM8 (extracellular) Antibody (#ACC-049) recognizes an extracellular epitope of TRPM8 from mouse, rat and human samples. 2.5 μM of Anti-TRPM8 (extracellular) antibody blocked cold and iciclin activation of human TRPM8 heterologously expressed in CHO cells, but did not block cold activation of TRPA1 and heat activation of TRPV1 (Figure 1), thus demonstrating the specificity of the antibody towards TRPM8. Anti-TRPM8 (extracellular) antibody could block rat TRPM8 cold activation with an IC50 of 144 nM. The antagonistic effect of the antibody was also observed in rat DRG neurons. Figure 1. Anti-TRPM8 (extracellular) antibody specifically blocks TRPM8.A. Human TRPM8 cold activation is blocked by 2.5 μM of Anti-TRPM8 (extracellular) Antibody (#ACC-049). B. TRPM8 iciclin activation is blocked by 2.5 μM of the same antibody. M8-B is a specific TRPM8 antagonist. C. Anti-TRPM8 (extracellular) antibody does not block cold activation of TRPA1 and heat activation of TRPV1 (D). AMG9090 and AMG6541 are specific TRPA1 and TRPV1 antagonist.Adapted from Miller, S. et al. (2014) with kind permission of Dr. Gavva, N.R. Department of Neuroscience, Amgen Inc., California, U.S.A. Expression of TRPM8 in LNCaP prostate carcinoma cell lineImmunocytochemical staining of LNCaP cells with Anti-TRPM8 (extracellular) Antibody (#ACC-049). A. Extracellular staining of intact LNCaP cells with Anti-TRPM8 (extracellular) antibody (1:100), followed by goat anti-rabbit-AlexaFluor-550 (red), (x100). B. Intracellular staining of LNCaP cells with Anti-TRPM8 (extracellular) antibody (1:1000), followed by goat anti-rabbit-AlexaFluor-488 (green), (x100). Sellak, H. et al. (2014) Am. J. Physiol. 307, C648. T-type CaV channels play an important role in the cellular response. However, α1H (CaV3.2) is the only T-type channel whose expression increases under low oxygen conditions. Hypoxia-response elements (HRE) are present in its promoter region and elicit its transcription under oxygen stress. The element is not present in the promoters of the other T-type genes. Upregulation of CaV3.2 occurs also at the protein level. Immunocytochemical staining of rat pulmonary artery smooth muscle cells (PASMCs) and rat pheochromocytoma cells (PC12) using Anti-CaV3.2 (CACNA1H) Antibody (#ACC-025) and Anti-CACNA1G (CaV3.1) Antibody (#ACC-021) shows that only CaV3.2 is indeed upregulated in both cell types in response to 3% O2. Figure 1. Upregulation of CaV3.2 under hypoxia.Immunocytochemical staining of rat pulmonary artery smooth muscle cells (PASMCs) and rat pheochromocytoma cells (PC12) using Anti-CaV3.2 (CACNA1H) Antibody (#ACC-025) and Anti-CACNA1G (CaV3.1) Antibody (#ACC-021). Staining shows upregulation of CaV3.2 and not CaV3.1 in response to oxygen stress.Adapted from Sellak, H. et al. (2014) with permission of the American Physiological Society. Expression of CaV3.2 in mouse cerebellumImmunohistochemical staining of mouse cerebellum frozen sections with Anti-CaV3.2 (CACNA1H) Antibody (#ACC-025), (1:100). A. CaV3.2 appears adjacent to Purkinje cells and in fibers in the molecular layer (red). B. Staining of Purkinje cells with mouse anti-parvalbumin (PV, green). C. Merged image of panels A and B demonstrates presence of CaV3.2 adjacent to Purkinje cells. Expression of CaV3.1 in rat cerebellumImmunohistochemical staining of rat cerebellum using Anti-CACNA1G (CaV3.1) Antibody (#ACC-021). A. CaV3.1 immunoreactivity (green) appears in the molecular layer. B. Nuclear staining using DAPI as the counterstain (blue). C. Merged images A and B. Mol = molecular layer. Gluska, S. et al. (2014) PLoS Pathog. 10, e1004348. Rabies is a neurotropic virus affecting the central nervous. This week’s paper focuses on an elegant study by Gluska, S. et al. which tries to decipher the mode of Rabies virus transportation from the peripheral nervous system to the central nervous system. The study shows many live cell imaging experiments of Rabies virus adopting NGF (nerve growth factor) mode of retrograde transport. Furthermore, the virus was shown to co-localize with p75NTR in living mouse DRGs using Anti-p75 NGF Receptor (extracellular)-ATTO-550 Antibody (#ANT-007-AO), (Figure 1). It seems that Rabies virus uses p75NTR receptor to enter cells and is transported into acidic vesicles with the receptor. 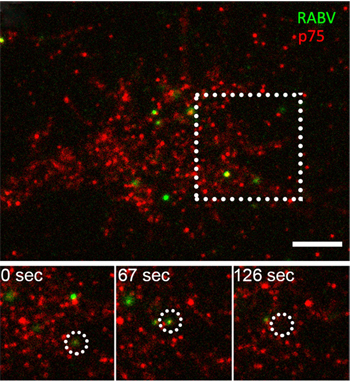 Although the virus can enter and travel in a p75NTR-independent manner, the p75NTR-dependent mode of transport enables Rabies virus to travel more quickly to the central nervous system. Figure 1. Co-localization of RABV with p75NTR in DRG neuron tips.Immunocytochemical staining of mouse DRGs using TIRF imaging. RABV-EGFP and Anti-p75 NGF Receptor (extracellular)-ATTO-550 Antibody (#ANT-007-AO) show that the virus and p75NTR particles shift from the periphery to the center of the growth cone, where they are internalized into the cell. Lower panel show co-localized puncta (left) shifting towards the center of the growth cone (middle) until internalized (right).Adapted from Gluska, S. et al. (2014) with kind permission from Prof. Eran Perlson, Dpt. Physiology and Pharmacology, Sackler Faculty of Medicine, Tel Aviv University, Israel. Raphael, M. et al. (2014) Proc. Natl. Acad. Sci. U.S.A. 111, E3870. TRPV6 is overexpressed in prostate cancer (Pca) as shown in immunohistochemical staining of human prostate sections using Anti-TRPV6 Antibody (#ACC-036). The molecular mechanism leading to its upregulation involves Orai1. Figure 1. Expression of TRPV6 in prostate cancer.Immunohistochemical staining of human prostate tissue using Anti-TRPV6 Antibody (#ACC-036). Very low expression of TRPV6 is observed in normal (right panel) and benign hyperplasia (middle panel) as opposed to significant expression in prostate adenocarcinoma.Adapted from Raphael, M. et al. (2014) Proc. Natl. Acad. Sci. U.S.A. 111, E3870. Frisk, M. et al. (2014) Am. J. Physiol. 307, H609. 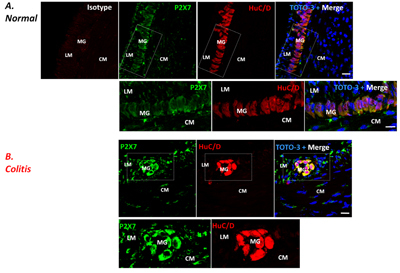 L-type Ca2+ channels are important for triggering contractions in cardiac myocytes. They in turn cause Ca2+release from the sarcoplasmic reticulum through Ryanodine receptors. T-tubules we found to be important and to function across the atria in order to maintain proper Ca2+ homeostasis across the atria. 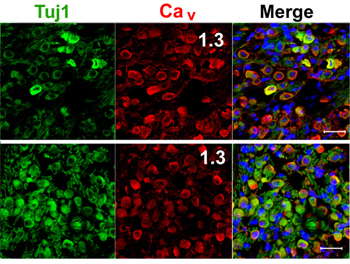 Proper localization of CaV1.2 channels in rat heart (Figure 1) was accomplished by immunocytochemical staining using Anti-CaV1.2 (CACNA1C) Antibody (#ACC-003). Figure 1. Localization of L-type CaV channels in rat atrial and ventricular cardiomyocytes.Immunocytochemical staining of rat ventricular cells (A), and atrial cells (B) using Anti-CaV1.2 (CACNA1C) Antibody (#ACC-003).Adapted from Frisk, M. et al. (2014) with permission of the American Physiological Society. Salman, S. et al. (2014) Am. J. Physiol. 307, C266. 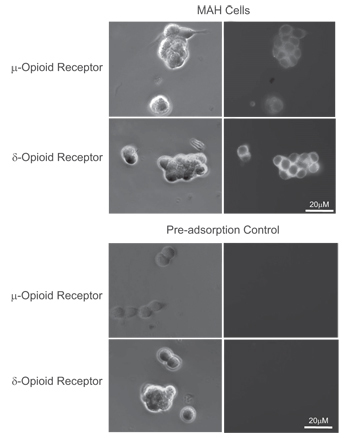 Neonatal rat adrenomedullary chromafin cells (AMCs) chronically stimulated with opioids are insensitive to hypoxia and hypercapnia. This may be the reason why prenatal exposure of pregnant mothers to opiates is subjected to higher rates of stillbirths and SIDS. The molecular mechanism of this physiological outcome seems to be caused by chronic activation of μ- and δ-opioid receptors. Indeed, their expression was demonstrated in immunocytochemical staining of immortalized rat chromaffin (MAH) cells using Anti-δ-Opioid Receptor (OPRD1) (extracellular) Antibody (#AOR-014) and Anti-μ-Opioid Receptor (OPRM1) (extracellular) Antibody (#AOR-011). Preincubation with the control peptide antigen shows that the antibodies specifically recognize their respective receptors (Figure 1). Chronic activation of μ- and δ-opioid receptors led in part to an increase in Kir6.2 KATP channel expression as shown in western blot analysis of MAH cells using Anti-Kir6.2 Antibody (#APC-020). Better understanding should definitely lead to therapeutic strategies that could benefit the offspring of women who use opiates during pregnancy. Figure 1. Expression of μ- and δ-opioid receptors in immortalized rat chromaffin (MAH) cells.Immunocytochemical staining of immortalized rat chromaffin (MAH) cells. A, C. Phase contrast image of MAH cells. B, D. Staining of cells with Anti-μ-Opioid Receptor (OPRM1) (extracellular) Antibody (#AOR-011), (B) and Anti-δ-Opioid Receptor (OPRD1) (extracellular) Antibody (#AOR-014), (D). E, G. Phase contrast image of MAH cells. F, H. Anti-μ-Opioid Receptor (OPRM1) (extracellular) Antibody (F) and Anti-δ-Opioid Receptor (OPRD1) (extracellular) Antibody were incubated prior to incubation with cells.Adapted from Salman, S. et al. (2014) with permission of the American Physiological Society. Hurtado, R. et al. (2014) FASEB J. 28, 730. Renal pacemakers are essential for propelling wastes from the kidney to the bladder. Their malfunction is the leading cause in pediatric renal failure. 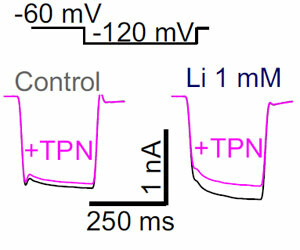 The pacemaker activity depends in part on T-type Ca2+ channels, namely CaV3.1. Inhibition of these channels significantly decreased the contractile frequency. In addition, immunohistochemical staining of mouse kidney sections using Anti-CACNA1G (CaV3.1) Antibody (#ACC-021) shows that the channel is expressed in the pelvis kidney junction (PKJ) (Figure 1) where they regulate the frequency of the upper urinary tract contractions. Figure 1. Expression of CaV3.1 in mouse pelvis kidney junction.Immunohistochemical staining of mouse kidney sections using Anti-CACNA1G (CaV3.1) Antibody (#ACC-021). A. CaV3.1 (purple) is detected in the pelvis kidney junction (PKJ). B. HCN3 staining (green), a marker of pacemaker cells, is detected in the PKJ. C. Same section stained for CaV3.1 (red). D. Merge of B and C panels shows high degree of co-localization between CaV3.1 and HCN3.Adapted from Hurtado, R. et al. (2014) with permission of Federation of American Societies for Experimental Biology. BDNF plays an important role in the activation of microglia immune cells. One of its effects includes the increase in intracellular Ca2+. 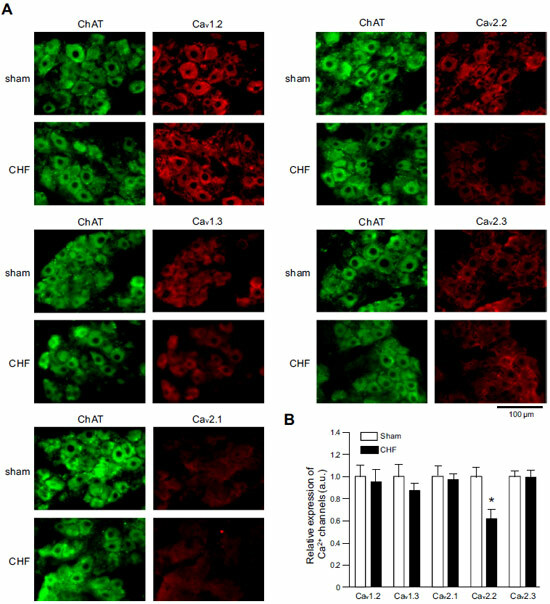 TRPC3 channel was found to be responsible for the BDNF-dependent Ca2+ mobilization. In fact BDNF stimulation leads to an increase in TRPC3 surface expression as shown in immunocytochemical staining of rat microglial cells using Anti-TRPC3 Antibody (#ACC-016), (Figure 1). Similar data were observed using the same antibody in flow cytometry. Figure 1. Upregulation of TRPC3 surface expression in rat microglia following BDNF stimulation.Immunocytochemical staining of rat microglia before (Control) and following BDNF stimulation (BDNF). A. Untreated cells were stained using Anti-TRPC3 Antibody (#ACC-016). BDNF-treated cells were stained using the same antibody. 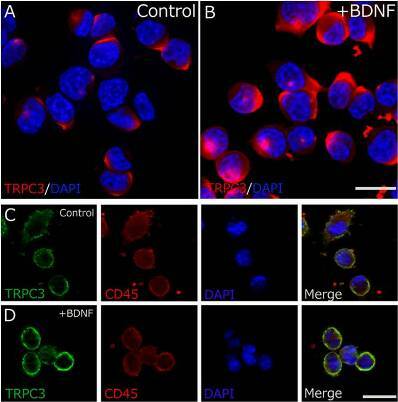 A significant increase in TRPC3 surface expression is observed following BDNF treatment. C. Same as in A. but including staining of CD45. D. Same as in B but including staining of CD45.Adapted from Mizoguchi, Y. et al. (2014) with permission of The American Society for Biochemistry and Molecular Biology. Immuno-colocalization of TRPC6 and TRPC3 in rat cerebellumImmunohistochemical staining of rat cerebellum frozen section using Guinea pig Anti-TRPC6 Antibody (#AGP-002) and rabbit Anti-TRPC3 Antibody (#ACC-016). A. TRPC6 staining (green) appears in molecular layer and in Purkinje cells. B. In the same section, staining of TRPC3 (red) appears as well in both molecular layer and Purkinje cells. C. Merge images of A and B indicates extensive co-localization. DAPI is used as the counterstain (blue). Gonzales, A.L. et al. (2014) Sci. Signal. 7, ra49. One basic regulatory aspect of blood flow control is the contraction of arterial myocytes in response to an increase in intraluminal pressure. In an elegant and thorough study, Gonzales, A.L. et al. propose a model involving phospholipase C (PLC), TRPC6 and TRPM4 as key players for the sensation of stretch and the initiation of myogenic constriction. Stretch activated transient inward cation current activity from myocytes was blocked by Anti-TRPC6 (extracellular) Antibody (#ACC-120) (Figure 1). 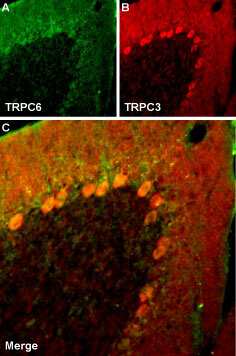 In addition, Anti-TRPC6 (extracellular) antibody detected TRPC6 in living rat cerebral artery smooth muscle cells. Immunostaining was blocked when incubating the antibody with the control peptide antigen (Figure 1). Figure 1. TRPC6 is required for stretch activation in myocytes.Electrophysiological recordings of myocytes incubated with Anti-TRPC6 (extracellular) Antibody (#ACC-120) in the absence (upper left) and in the presence (lower left) of the control peptide antigen. Immunocytochemical staining of living rat cerebral artery smooth muscle cells using Anti-TRPC6 (extracellular) antibody. Preincubation with the control peptide antigen blocks TRPC6 immunostaining (lower right panel).Adapted from Gonzales, A.L. et al. with permission of the American Association for the Advancement of Science. Kimm, T. and Bean, B.P. (2014) J. Neurosci. 34, 9182. SNX-482 (#RTS-500) a peptide toxin originally isolated from the tarantula Hysterocrates gigas venom, is commonly used as a blocker of CaV2.3 Ca2+ channels. However, it was accidentally found to block IA currents which are prominent in SNC dopaminergic neurons. In such neurons, 500 nM SNX-482 almost completely blocked A-type currents. The effect of SNX-482 was then tested on HEK 293 cells expressing recombinant KV4.3 channels (Figure 1). Overall, KV4.3 currents were inhibited by SNX-482 with an IC50 of < 3 nM. SNX-482 is a more potent blocker for KV4.3 than it is for CaV2.3, its original target. The toxin also blocked KV4.2 currents expressed in HEK 293 cells, albeit less potently. Figure 1. SNX-482 blocks KV4.3 currents heterologously expressed in HEK 293 cells.Effect of 3 nM (top) and 60 nM (bottom) SNX-482 (#RTS-500) on current carried by cloned KV4.3 channels expressed in HEK-293 cells (left panels). 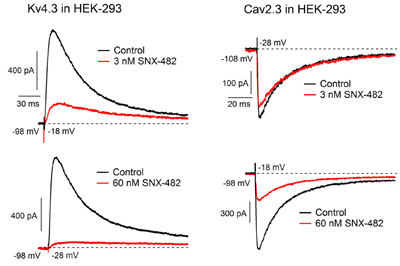 Effect of 3 nM (top) and 60 nM (bottom) SNX-482 on current carried by cloned CaV2.3 channels expressed in HEK-293 cells. Recordings at 23°C.Adapted from Kimm, T. and Bean, B.P. (2014) with permission of the Society for Neuroscience. BDNF signaling is involved in oligodendrocyte cell maintenance. In particular, it increases DNA synthesis in oligodendrocyte progenitors and enhances oligodendrocyte differenciation to myelin-expressing cells. Cuprizone-induced demyelination in a mouse model followed by ACPD treatment (a mGluR agonist) caused an increase in astrocyte-derived BDNF followed by myelin production. Astrocytes indeed express BDNF as shown in immunohistochemical staining of mouse brain sections using Anti-BDNF Antibody (#ANT-010). BDNF co-localizes with GFAP, an astrocyte marker and not with NF-L. The increase in BDNF expression was abolished upon treatment with TrkB-FC, an inhibitor of BDNF signaling. Figure 1. Expression of BDNF in astrocytes.Immunohistochemical staining of mouse brain sections using Anti-BDNF Antibody (#ANT-010). BDNF (red) is expressed in astrocytes as shown by its co-localization with GFAP, an astrocyte marker (merge panel).Adapted from Fulmer, C.G. et al. (2014) with permission of the Society for Neuroscience. Wang, W. et al. (2014) J. Biol. Chem. 289, 16802. The KCNE3 KV β subunit is associated with a number of inner ear diseases. However, its exact role in auditory neurons is not clear. 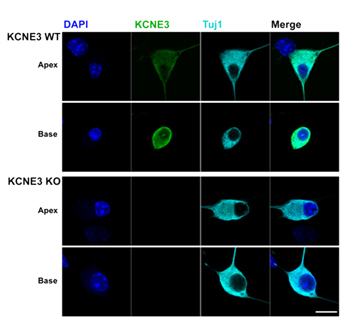 Kcne3-/- mice were generated, and the role in of KCNE3 in spiral ganglion neurons (SGNs) was studied. Immunocytochemical staining of mouse SGNs using Anti-KCNE3 (MiRP2) Antibody (#APC-118) shows that the auxiliary subunit is indeed not expressed in Kcne3-/- knockout cells (Figure 1). 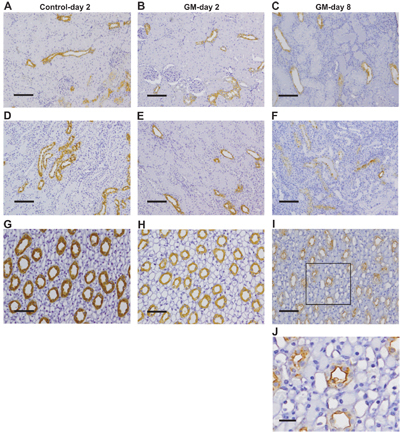 Immunohistochemical staining of mouse SGN sections using the same antibody suggests that KCNE3 expression in SGN is not developmentally regulated. 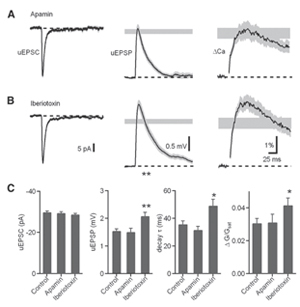 Electrophysiological experiments demonstrate that KCNE3 regulates the magnitude of K+ currents important for maintaining the electrical phenotype of auditory neurons. Figure 1. Expression of KCNE3 in mouse spiral ganglion neurons.Immunocytochemical staining of mouse spiral ganglion neurons (SGNs). Wild type cells and Kcne3-/- knockout cells were stained with Anti-KCNE3 (MiRP2) Antibody (#APC-118). KCNE3 was detected in the SGNs from wild type (upper panels) and not in kcne3-/- cells (lower panels).Adapted from Wang, W. et al. (2014) with permission of The American Society for Biochemistry and Molecular Biology. Huang, P. et al. (2014) J. Biol. Chem. 289, 17658. Apart from its plasma membrane localization, P2X4 purinergic receptor is also detected in intracellular lysosome membranes. 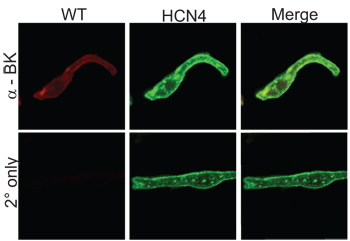 P2X4 forms functional channels that are sensitive to luminal pH. 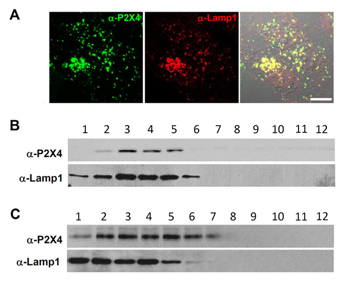 Immunocytochemical staining of fixed and permeated COS1 cells using Anti-P2X4 Receptor Antibody (#APR-002) shows that P2X4 co-localizes with Lamp1, a lysosomal marker (Figure 1A). In addition, fractionation of COS1 cells shows that P2X4 receptor is detected in the lysosome fraction along with Lamp1 (Figure 1B). Similar results were obtained when P2X4 was heterologously expressed (Figure 1C). Postulated roles for P2X4 in lysosomes include a reserve for plasma membrane P2X4 and lysosomal trafficking. Figure 1. Expression of P2X4 receptor in lysosomes.Immunocytochemical staining of fixed and permeated COS1 cells using Anti-P2X4 Receptor Antibody (#APR-002). A. P2X4 staining (green) co-localizes with Lamp1 (red), a lysosomal marker. B. Fractionation of COS1 cells shows that P2X4 receptor is detected in the lysosome fraction along with Lamp1. C. Similar results are obtained when P2X4 is heterologously expressed.Adapted from Huang, P. et al. (2014) with permission of The American Society for Biochemistry and Molecular Biology. Munoz, M.C. et al. (2014) J. Endocrinol. 221, 215. Growth hormone (GH) has a number of important physiological roles, including the control of heart and kidney functions. The effect of GH excess on the rennin-angiotensin system (RAS) was investigated in part through the mas receptor. 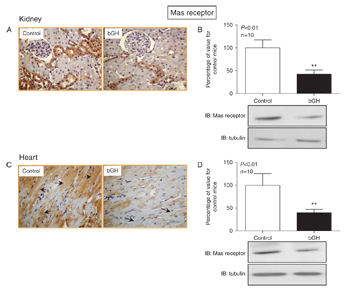 Immunohistochemical staining of transgenic mice over-expressing GH shows that levels of Mas receptor (Figure 1), detected using Anti-Angiotensin-(1-7) Mas Receptor Antibody (#AAR-013) significantly decrease in kidney (A) and in heart (C) of mice over-expressing GH. Western blot analysis of the same tissues (B, D) also shows a decrease in the expression of Mas receptor. The overall data suggest that the change in RAS profile could contribute to the increased incidence of hypertension, cardiovascular, and renal alterations observed in these animals. Figure 1. Expression of Angiotensin-(1-7) Mas Receptor in mouse heart and kidney.A, C. Immunohistochemical staining of mouse over-expressing growth hormone (GH) using Anti-Angiotensin-(1-7) Mas Receptor Antibody (#AAR-013). Mas receptor staining decreases in mice over-expressing GH (right panels). B, D. Western blot analysis of same tissues in A and C using Anti-Angiotensin-(1-7) Mas Receptor antibody also shows a decrease in Mas receptor’s expression.Adapted from Munoz, M.C. et al. (2014) with permission of the Society for Endocrinology. Ferron, L. et al. (2014) Nat. Commun. 5, 3628. Fragile X Syndrome (FXS) is the most common form of mental retardation. It is characterized by synaptic dysfunction. Fragile X mental retardation protein (FMRP), an RNA binding protein involved in translation, was found to regulate neuronal N-type CaV channels, which are critical for synaptic transmission. Blocking CaV2.2 with ω-Conotoxin GVIA (#C-300) and CaV2.1 with ω-Agatoxin IVA (#STA-500) inhibited exocytosis by almost 83% when co-applied. The role of FMRP was shown to reduce CaV2.2 currents by targeting the channel to the proteosome degrading pathway, thus reducing cell surface expression of the channel. 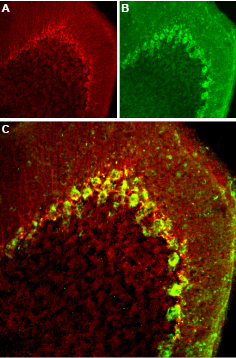 Knocking down FMRP in DRGs increased synaptic vesicle exocytosis via CaV2.2 channels. 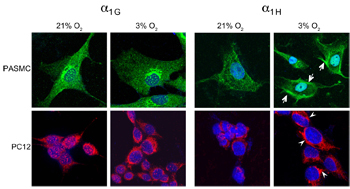 Figure 1C shows that treating FMRP knocked down cells with ω-Conotoxin GVIA reduced exocytosis to levels comparable with control conditions. In FXS, a mutation in FMRP gene leads to its transcriptional silencing. Thus, blocking CaV2.2 may be beneficial in FXS. Figure 1. Knockdown of FMRP enhances synaptic vesicle exocytosis in presynaptic terminals of DRG neurons via CaV2.2 channels.A and B. vGpH response to 40 AP at 10 Hz from presynaptic terminals of DRG neurons transfected with Ctrl shRNA (A) or FMRP shRNA (B) before and after treatment with ω-Conotoxin GVIA (#C-300) and ω-Agatoxin IVA (#STA-500). Fluorescence intensities were normalized to thepeak of a brief application of NH4Cl. C. Normalized vGpH responses to 40 AP at 10 Hz from presynaptic terminals of DRG neurons transfected with Ctrl shRNA (black-filled bar, 100±10.6%, n = 38) or FMRP shRNA (red open bar, 137.0±12.6%, n = 25, P = 0.027). 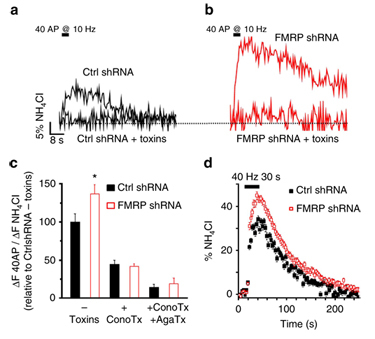 ω-conotoxin GVIA (ConoTx) reduces Ctrl shRNA and FMRP shRNA responses to a similar level (44.7±4.9%, n = 15 and 41.6±3.3%, n = 24, respectively). ω-conotoxin GVIA and ω-agatoxin IVA (AgaTx) application reduces further the responses: Ctrl shRNA = 17.3±3.2%, n = 38, and FMRP shRNA = 18.1±5.0%, n = 27. D. Average vGpH response to a 40Hz stimulation for 30 s from presynaptic terminals of DRG neurons transfected with Ctrl shRNA (blackfilled squares) or FMRP shRNA (open red squares).Adapted from Ferron, L. et al. (2014) with permission of Springer Nature. Lv, P. et al. (2014) J. Neurosci. 34, 7383. CaV1.3 channels are abundantly expressed in spiral ganglion neurons (SGNs) and are mostly responsible for Ca2+ currents in these cells. Immunohistochemical staining of mouse cochlear sections using Anti-CaV1.3 (CACNA1D) Antibody (#ACC-005) shows that the channel is expressed in the apical and basal regions of the cochlea (Figure 1). CaV1.3-/- mouse model shows residual Ca2+ currents in SGNs which are provided by CaV1.2 channels. Additional study on the respective roles of these L-type channels in SGN function is under work. Figure 1. 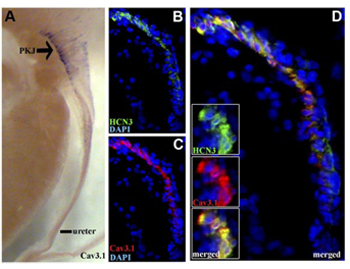 Expression of CaV1.3 in mouse cochlea.Immunohistochemical staining of mouse cochlear sections using Anti-CaV1.3 (CACNA1D) Antibody (#ACC-005). CaV1.3 staining (red) is detected in both apical (upper panels) and basal (lower panels) regions of the cochlea. Neurons were labeled with Tuj1 (green) and nuclei were stained with DAPI (blue). Scale bar, 20 μm.Adapted from Lv, P. et al. (2014) with permission of the Society for Neuroscience. Ambrosini, E. et al. (2014) Hum. Mol. Genet. 23, 4875. Gain-of-function mutations in the gene encoding the Kir2.1 channel are associated with SQT3, a heart disorder characterized by QT shortening. In part, analysis of the effects of K346T mutation showed increased Kir2.1 surface expression and stability at the plasma membrane as shown in immunocytochemical staining and western blot analysis of human astrocytoma U-251 MG cells using Anti-Kir2.1 (KCNJ2) Antibody (#APC-026) (Figure 1). Figure 1. Expression of Kir2.1 in human U-251 MG cells.A. Immunocytochemical staining of human astrocytoma U-251 MG cells expressing WT or K346T channels using Anti-Kir2.1 (KCNJ2) Antibody (#APC-026) (red). WT channels are localized in perinuclear vesicles (short arrows in upper panel) and occasionally at plasma membranes (long arrows in upper panel). Mutated channels are mainly expressed at plasma membranes (long arrows in lower panel). 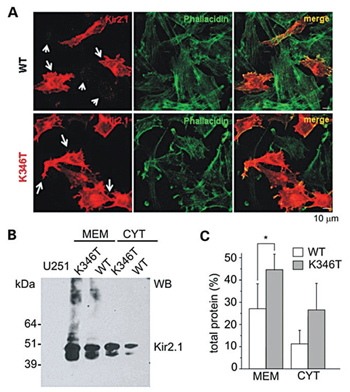 B. WB analysis of membrane (MEM) and cytosolic (CYT) proteins derived from WT or K346T Kir2.1-expressing cells using Anti-Kir2.1 (KCNJ2) Antibody. D. Densitometric analysis of protein bands from four independent experiments (mean ± SEM, ∗P < 0.05).Adapted from Ambrosini, E. et al. (2014) with permission of Oxford University Press. Kudryavtseva, O. et al. (2014) Am. J. Physiol. 306, H1287. L-type channels are important for vascular smooth muscle cell (VSMC) contraction and differentiation. Its expression is however lost during their differentiation. siRNA targeting CaV1.2 was used to study the role of the channel in VSMC contraction and structure of mesenteric arteries. Immunocytochemical staining of isolated rat VSMCs treated with siRNA against CaV1.2 channels showed a significant decrease in CaV1.2 expression using Anti-CaV1.2 (CACNA1C) Antibody (#ACC-003), (Figure 1). Overall, the study shows that downregulation of L-type channels leads to a non-contractile VSMC phenotype. 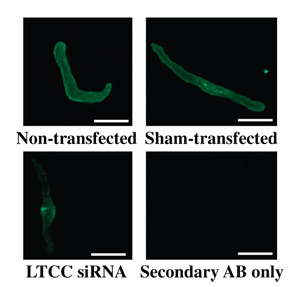 Figure 1. siRNA against CaV1.2 in rat VSMCs significantly decreases its expression.Immunocytochemical staining of vascular smooth muscle cells (VSMCs) isolated from nontransfected arteries, sham-transfected arteries, and arteries transfected with siRNA targeting LTCC. Cells were stained using Anti-CaV1.2 (CACNA1C) Antibody (#ACC-003). Omission of primary antibody was used as a negative control. Bars represent 20 μm.Adapted from Kudryavtseva, O. et al. (2014) with permission of the American Physiological Society. Expression of CaV1.2 in mouse cerebellumImmunohistochemical staining of mouse cerebellum with Anti-CaV1.2 (CACNA1C) Antibody (#ACC-003). 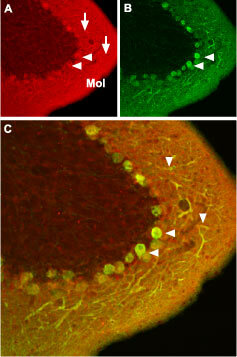 A. CaV1.2 (red) appears in Purkinje cells (horizontal arrows) and is distributed diffusely in the molecular layer (Mol) including in Purkinje dendrites (vertical arrows). B. Staining of Purkinje nerve cells with mouse anti-Calbindin 28K (green) demonstrates the location of dendrites in the molecular layer. C. Merged image of panels A and B. He, S. et al. (2014) J. Neurosci. 34, 5261.
mAChR activation increases the magnitude of synaptic potentials and Ca2+ influx by inhibiting KCa1.1 (BK) channels through L-type Ca2+ channels. Activation of post-synaptic mAChR on specific cell types contributes to plasticity in auditory processing. BK channels were identified by whole-cell current-clamp recordings. The SK blocker Apamin (#STA-200) had no effect on uEPSPs. However, the BK blocker Iberiotoxin (#STI-400) increased uEPSPs, mimicking the activation of mAChRs (Figure 1). Figure 1. Blocking BK channels mimics the mAChR activation effects.A. and B. uEPSC (left), uEPSP (middle), and ΔGuEPSP/Gsat (right) measured in the presence of Apamin (#STA-200) (A) and Iberiotoxin (#STI-400) (B). The range of amplitudes ±SEM of the uEPSP and ΔGuEPSP/Gsat measured in control conditions are shown by the gray shaded bars. C. Summary of the uEPSC amplitude, uEPSP amplitude, uEPSP decay time constant, and ΔGuEPSP/Gsat in each pharmacological condition.Adapted from He, S. et al. (2014) with permission of the Society for Neuroscience. Immature cortex has higher TRPC3 expression and is more sensitive and prone to seizures in many animal models of epilepsy. Indeed, immunohistochemistry of rat coronal brain sections using Anti-TRPC3 Antibody (#ACC-016) showed that the channel is highly expressed in brains from immature rats and very weak in mature cortex (Figure 1). Neurons in cortical dysplasia (CD) display features that are reminders of immature cortex. TRPC3 expression is also elevated in CD (Figure 1). In both immature and CD brains, TRPC3 expression accompanied by low Ca2+/low Mg2+ conditions, gives rise to depolarization and epileptiform activity. Figure 1. Expression of TRPC3 in rat cortex.Immunohistochemical staining of rat cortical brain slices using Anti-TRPC3 Antibody (#ACC-016). 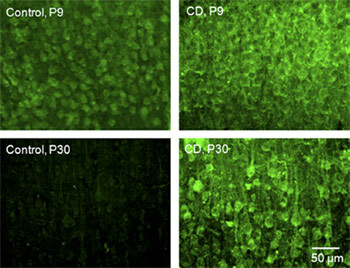 TRPC3 expression (green) is high in immature (P9) rat cortex and barely detectable in mature (P30) brain cortex. Its expression is high in cortical dysplasia (CD).Adapted from Zhou, F.W. and Roger, S.N. (2014) with permission of the American Physiological Society. Farhy Tselnicker, I. et al. (2014) Proc. Natl. Acad. Sci. 111, 5018. In the treatment of bipolar disorder, Li+ affects neuronal excitability. Farhy Tselnicker, I. et al. found a dual regulation of GIRK channels by Li+. In hippocampal neurons, therapeutic doses of Li+ increased GIRK currents but attenuated neurotransmitter- evoked GIRK currents mediated by GPCRs. Increased basal GIRK currents induced by Li+ could be blocked by the GIRK blocker Tertiapin-Q (#STT-170), (Figure 1). This work links ion channels and GPCR to bipolar disorder. Figure 1. Li+ modulates GIRK activity in hippocampal neurons.Incubation of neurons with 1 mM Li+ increased Ibasal in low-K+ solution. Ibasal was measured at −120 mV (voltage step from the holding potential of −60 mV), to enhance the sensitivity of measurement. Representative traces recorded in the low-K+ solution before (black) and after (pink) application of Tertiapin-Q (#STT-170).Adapted from Farhy Tselnicker, I. et al. (2014) with permission of Proceedings of the National Academy of Sciences. Liang, B. et al. (2014) Cardiovasc. Res. 101, 175. 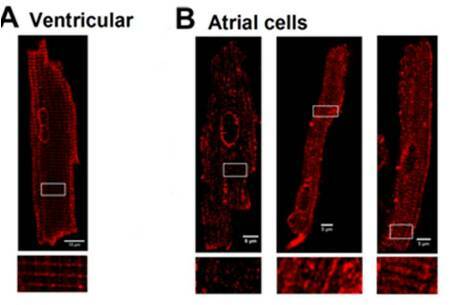 The role of GIRK channels in the heart ventricle was investigated. Immunohistochemistry of mouse heart using Anti-KCNJ5 (Kir3.4) Antibody (#APC-027) showed that GIRK4 (KCNJ5) is localized in the outer sarcolemmas and t-tubules. Expression of the channel was not detected in GIRK4 knockout (KO) mice (Figure 1). Anti-KCNJ5 (Kir3.4) Antibody was also used in rat heart and human left ventricle tissue. In addition, electrophysiological studies using Tertiapin-Q (#STT-170) reversed the shortening of the action potential duration. Overall, GIRK4 seems to contribute to ventricular repolarization. Figure 1. Expression of GIRK4 (KCNJ5) in mouse heart.Immunohistochemical staining of mice heart using Anti-KCNJ5 (Kir3.4) Antibody (#APC-027). A. GIRK4 staining in GIRK4 KO mice atrial sections. B. GIRK4 staining in GIRK4 KO mice ventricular sections. C. GIRK4 staining in GIRK1 KO mice atrial sections and (D) ventricular sections. Staining demonstrates that the channel is localized to the outer sarcolemma and the ventricular t-tubular system. Scale bar = 10 μm.Adapted from Liang, B. et al. (2014) with permission of the European Society of Cardiology. Nelson, J.W. et al. (2014) Am. J. Physiol. 306, C178. 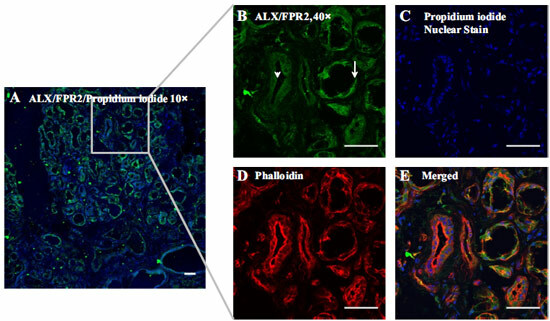 ALX/FPR2 is expressed in mouse submandibular glands and human minor salivary glands (hMSG), shown in immunohistochemical staining using Anti-Human FPR2/ALX (extracellular) Antibody (#AFR-002). Activation of the receptor protected mSMG from apoptosis and may be of potential therapeutic use for treating Sjögren’s syndrome (SS), an autoimmune disorder characterized by chronic inflammation and destruction of salivary and lacrimal glands. Figure 1. Expression of ALX/FPR2 in hMSG.Immunohistochemical staining of human fixed frozen minor salivary gland sections using Anti-Human FPR2/ALX (extracellular) Antibody (#AFR-002). A. Merged image of FPR2 staining (green) with propidium iodide. B. FPR2 staining (green) is strongly localized on the apical side of acinar and ductal hMSG. C. Cell nuclei are stained with propidium iodide (blue). D. Labeled phalloidin is used to label actin filaments. E. Merged image of B, C and D.Adapted from Nelson, J.W. et al. (2014) with permission of the American Physiological Society. Tu, H. et al. (2014) Am. J. Physiol. 306, C132. Chronic heart failure (CHF) is mainly characterized by an imbalance of parasympathetic and sympathetic cardiac nerve activities. Immunohistochemical staining of rat intracardiac ganglia (ICG) and stellate ganglia (SG) using Alomone Labs Anti-CaV1.2 (CACNA1C) Antibody (#ACC-003), Anti-CaV1.3 (CACNA1D) Antibody (#ACC-005), Anti-CACNA1A (CaV2.1) Antibody (#ACC-001), Anti-CACNA1B (CaV2.2) Antibody (#ACC-002) and Anti-CaV2.3 (CACNA1E) Antibody (#ACC-006) showed that all CaV subtypes tested are expressed in parasympathetic and sympathetic cardiac neurons (Figure 1). CHF however caused a decrease in N-type CaV channels in parasympathetic neurons and an increase in sympathetic neurons as demonstrated in Figure 1. Patch-clamp recordings of the different neuron types using ω-Conotoxin GVIA (#C-300) showed that N-type CaV currents were indeed lower in parasympathetic neurons. Figure 1. Expression of CaV α subunits in rat ICG.Immunohistochemical staining of rat intracardiac ganglia (ICG) using Anti-CaV1.2 (CACNA1C) Antibody (#ACC-003), Anti-CaV1.3 (CACNA1D) Antibody (#ACC-005), Anti-CACNA1A (CaV2.1) Antibody (#ACC-001), Anti-CACNA1B (CaV2.2) Antibody (#ACC-002) and Anti-CaV2.3 (CACNA1E) Antibody (#ACC-006). All CaV subtypes are expressed in sham treated rats but N-type CaV channel levels are decreased in CHF rats.Adapted from Tu, H. et al. (2014) with permission of the American Physiological Society.